Please fill out and submit the registration form above to reserve your seat. Check can be made out to Force Free Rescue Rehabilitators and mailed to FFRR 3829, Wesley St Myrtle Beach, SC 29579. You may contact Debbie McAvey at (843)903-5530 or Lindsay Martin at (843)796-9467 for more information. Studying and implementing force free techniques since 1996, Diane can easily help to understand the mechanics, the benefits, the techniques, and the how to. As an expert in using force free with all levels of behavior problems, as well as being a cross-over trainer herself she speaks intelligently to a diverse group of trainers and to the public. Garrod currently has two Belgian Tervurens and a Mini-Australian Shepherd. She has worked with all types of animals from bunnies to alpaca and llamas, horses, and parrots. Diane Garrod is a PCT-A (professional canine trainer – accredited), with a degree in Communication and Journalism from University of Wisconsin. 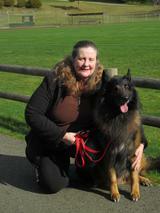 Garrod is a Founding Member of the Pet Professionals Guild: the association of force free pet professionals (PPG). She is Owner of Canine Transformations Learning, Langley, Washington (celebrating 12 years, January 2019), awarded 2016 and 2017 Best Business category Dog Trainer by Langley, WA Awards Committee. Garrod has skills certifications in resource guarding, animal behavior, theriogenology, writing for the sciences, fear in dogs and cognition and emotion. Most recent certifications are in predation and aggression, 2017; and Aggression in Dogs: Safety, Defensive Handling, and Training 2017, as well as Fear Free Certification, through VetFolio by Marty Becker, DVM (fear free veterinarian practices) 2017. She is also a Guild Certified Tellington Touch Practitioner since 2011. Garrod’s main areas of research include stress in dogs and is the creator of Stress Matters; the Canine Emotional Detox: Systematic stress release protocol for challenging canines. She is an international speaker on this topic and on solving the aggression puzzle, force free. Garrod trains in Rally-O, Rally-O Freestyle, Treibball (Certified Instructor and Judge, American Treibball Association (ATA), Barn hunting. She offers classes and workshops in Treibball, puppy growth privates, confident transformations for fearful dogs, four levels of reactive dog classes, privates in aggression and reactivity issues (dog dog, dog human (especially biters), combination of both, environmental sensitivities and more) with recent addition of tricks training workshops. Garrod is a regular contributor to PPG’s Barks from the Guild and has a DVD feature, 2015 www.tawzerdog.com on The Canine Emotional Detox: Systematic Stress Release Protocol for Challenging Canines. Diane volunteered on PPG’s steering committee, ethics committee and helped create this organization – all volunteer – for force free pet professionals www.petprofessionalsguild.com . She is a supporter of PPG’s “Shock Free Coalition” to end shock collar existence in U.S. She offers FREE to public “Let’s Talk Dog” series locally, to present positive reinforcement to the public and to live streaming on Facebook. She has volunteered with her own therapy dog, Kody Bear, Love On A Leash, at senior care centers, hospitals, children’s programs throughout the area to include library reading programs She has volunteered with local shelter’s Wag n’ Walk program to do Treibball demos during their annual event to raise money for WAIF. Other volunteer activities includes, Blessings for the Animals, Habitat for Humanity; American Heart Association, Best Friends Society (Kanab, Utah), Oregon Humane Society, Tacoma, WA shelter. Diane is a charter member of NATE (National Association Treibball Enthusiasts) and served as marketing director.